Stop and take a deep breath. One of the hardest things to do it to know how to calm down when angry. When angry feelings begin to bubble up, the risk that you will say or do something that you later regret rises. If you let your anger continue to escalate, watch out! The damage potential, both to you and to others, zooms higher. 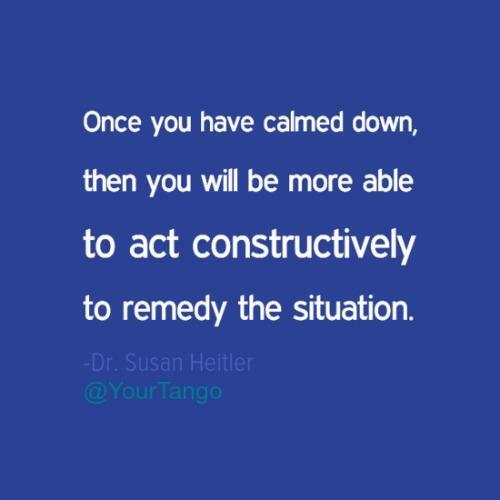 Once you have calmed down, then you will be more able to act constructively to remedy the situation. The goal then becomes getting what you want without clobbering others. Here are 8 essential techniques that, when used together, can enable you to calm down so that you can get your concern addressed via cooperative talking...instead of unleashing your anger. Remove yourself from a situation you can’t handle. I repeat, remove yourself from a situation you can’t handle. Memorize this mantra, and use it immediately any time you feel frustration, irritation or anger rising. Gracefully leave the room, or at least gracefully change the topic. 2. Exit earlier than you think you need to, when your anger is at a level 3 on a scale to 10. By the time you’re up over level 4, exits become increasingly difficult. Self-righteous indignation by then will propel you to keep trying to prove your point. 3. Distract yourself; change your focus. Phew. You’ve separated yourself from that situation you couldn’t handle. Read a magazine. Check your social media. Any distraction helps. Keep a joke book handy; chuckling deletes anger. Positive thoughts trump anger, including thoughts that bring forth feelings of gratitude or affection. Close your eyes and picture yourself on a beach. Envisioning positive images can be even more calming than thoughts. 4. Breathe deeply, then relax your muscles. Clear the air emotionally by clearing the physical air in your lungs. The same slow deep breathing that helps with giving birth to babies and with releasing constipated bowels can bring cooling energy to you when you’re trying to calm down your inner fire. Focus especially on relaxing the little muscles around your mouth and eyes, your arms, and your hands. Think about something that brings forth a natural smile, or just tell yourself to smile in spite of how you feel. Smiles soothe, even when they do not come naturally. Before you return to the difficult situation, first prepare yourself to re-enter by picturing yourself offering gestures of niceness. Plan to talk about pleasant topics before resuming the tough one. Be sure that you and whomever you were talking with all are securely back in the happy zone before venturing again into sensitive realms. Re-launch the tough topic by agreeing first with all you can find to agree with about the points the other person has made. “I agree that ….” Look especially to understand and verbalize what you heard with regard to the other person’s concerns. 8. Then share your concerns on the tough issue and find a solution that works for both of you. –Be sure to keep yourself calm, relaxed, and collaborative. –Keep your ears open to hearing others’ concerns in the best possible light. –Avoid insisting on particular solutions. –Again, stay aware of your tone. Keep it friendly–or else take another quick exit. Any slippage into adversarial tones can undo all of the above. Use even just the first of these 8 techniques. You will be on the road to anger control if you at least remove yourself from provocative situations. Use them all and you will enter the realm of emotional maturity. Young children get angry often. Adults—that is, people who function emotionally like adults—control their anger instead of using anger to control others. So next time you begin to feel mad, recognize it right away so you can launch your new anger control techniques. Calm down. Pride yourself on dealing with life’s bumps via quiet talking and cooperative problem-solving. That road to leads to the land of well-being. Enjoy! Dr. Heitler's new book and website offer practical tools for what to do when you feel sad, mad or scared. See Prescriptions Without Pills: For Relief from Anger, Anxiety and More and prescriptionswithoutpills.com.